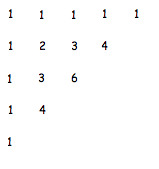 I think that it's time to look at Pascal's Triangle afresh. So, let's see what happens when we turn it around in a special way. So we start with the layout as usual, turn it anticlockwise 45 degrees and then take off the top line of ones. BUT if we take the digital roots of the numbers and see the first 30 lines we have a new look to Pascal's Triangle as shown below. 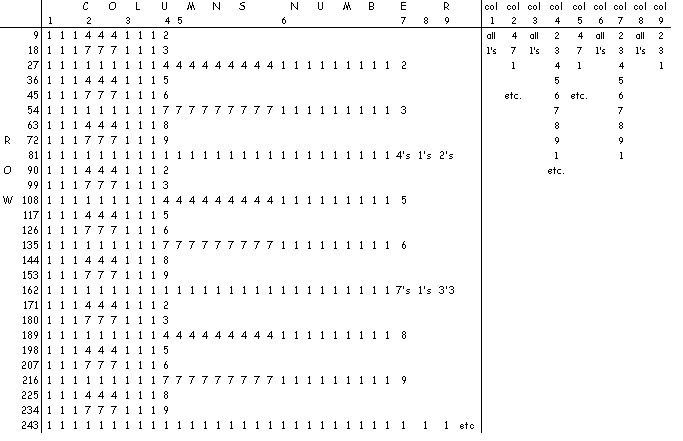 So here you have an awful lot of numbers in rows and columns to explore. Those of you with some spreadsheet experience (or those of you that are quick to learn such things!) should go to the HINT at this point, before going further. Some starting points for further explorations. So you could do a similar thing, looking at line numbers of a different multiple. If you do a few you then could compare your discoveries. 2. You could take just one line [e.g.30] and use the spreadsheet to extend it very far. 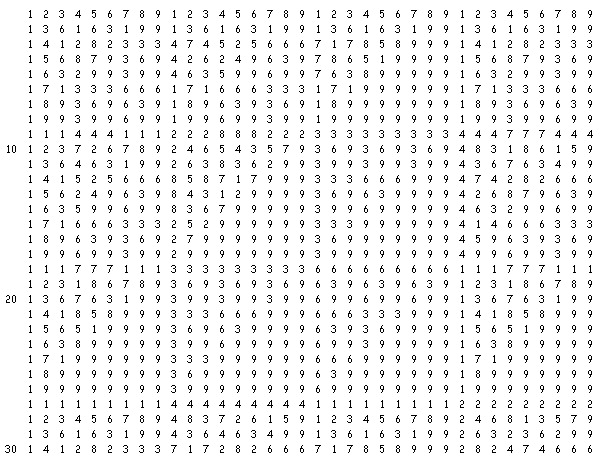 Here I've taken line 30, and grouped the numbers in that row in 9's and then three 9's together and underneath each other. I did this because my eyes led me to some interesting repetitions. I then noted down things according to the columns I had placed them under. See what other things you can notice with this line or any other that you choose. c) Look for reflections of patterns. AND see if you can explainWHY? these patterns are occurring. Maths Supporting SET. Generalising. Geometric sequences. Digital roots. Properties of numbers. Investigations. 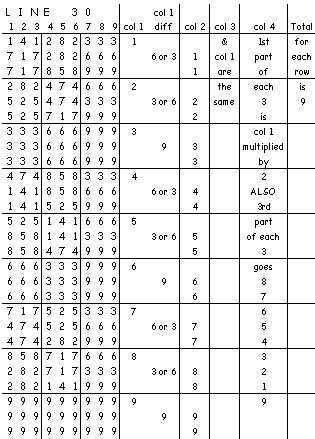 Arithmetic sequences. Working systematically. Patterned numbers. Creating and manipulating expressions and formulae.